Until Back-To-School Eve. And then the crushing reality of the coming morning would hit. Deep dark depression would seep into my happy colored sunshine and sprinkler thoughts. Devastation would cripple me. I couldn't possibly move. I couldn't possibly put my *own* pajamas on and brush my teeth. My legs were practically broken. Until I remembered that shining stack of brand new school supplies waiting to be put into a stiff new backpack. And then my legs would be just fine. But my sunshine and sprinkler thoughts had been shattered. Ruined. I still couldn't possible go to bed. At least not without cookies. Maybe some cookies like these. 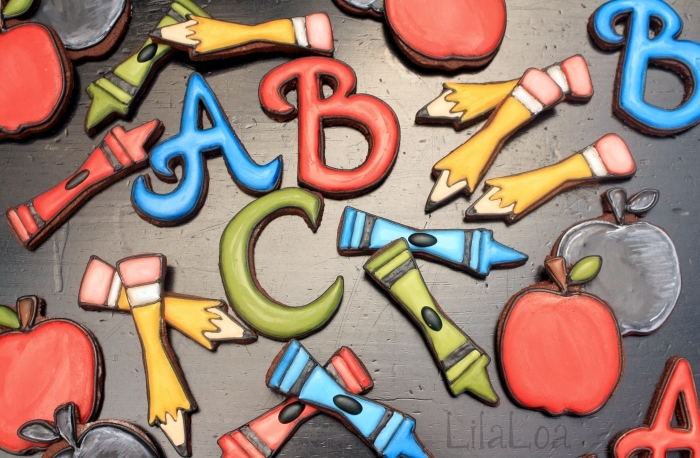 I know half of you are looking at those chalkboard apples and thinking I'm basically a bad person for even *thinking* about giving that much black food coloring to a child. Well, first, I have to say that I didn't plan on sharing these. So there. And second, they actually don't have very much food coloring at all. I ate an entire cookie (for research -- you know how it is) and my tongue was barely a different color. Do you want to know my super top-secret black icing secret? 1. Start with THICK icing. It's important that you don't thin it out at all. 2. Okay, so cocoa powder isn't exactly a top-secret icing ingredient. Do you see all those big chunks though? We don't want those in our icing. 3. So you should add just enough water to dissolve the cocoa powder into a paste. The paste will turn out to be about a 4-5 count consistency. AND.... when you add water to the cocoa powder before adding it to the icing... it darkens the cocoa. And dark cocoa is a lot closer to black than light cocoa. 4. Add the cocoa powder paste to the icing like you would food coloring. 5. 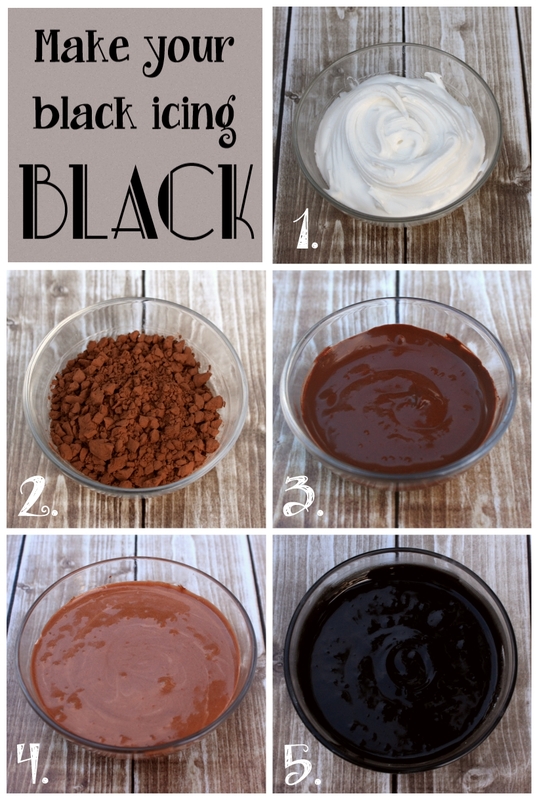 Add only a few drops of black food coloring. It will be a nice, robust black color. Not partially purple. Not mostly gray. You don't even have to wait overnight for it to darken. You could though, if you wanted to. I don't mind. *** You should know - the icing will taste slightly chocolatey. Which is no big deal for me because I usually make chocolate cookies. But even when I make vanilla sugar cookies, I think that a slightly chocolate taste is much better than the bitter taste of too much black food coloring. But that's your call. *** Some people are ALLERGIC TO CHOCOLATE. (The horror! I know!) Please make sure that the people who are eating these cookies know that there is cocoa powder in the icing. *** You don't need to add a lot of cocoa powder. If you add too much, it can weight down the icing and cause ripples or dents in the surface of the icing. Use about 1 teaspoon of cocoa powder with 1/2 teaspoon of water for every 1 cup of white icing. My two favorite cocoa powders are -- CALLEBAUT and COOKIE COWGIRL. HOW TO MAKE RED ICING without using an entire bottle of food coloring! 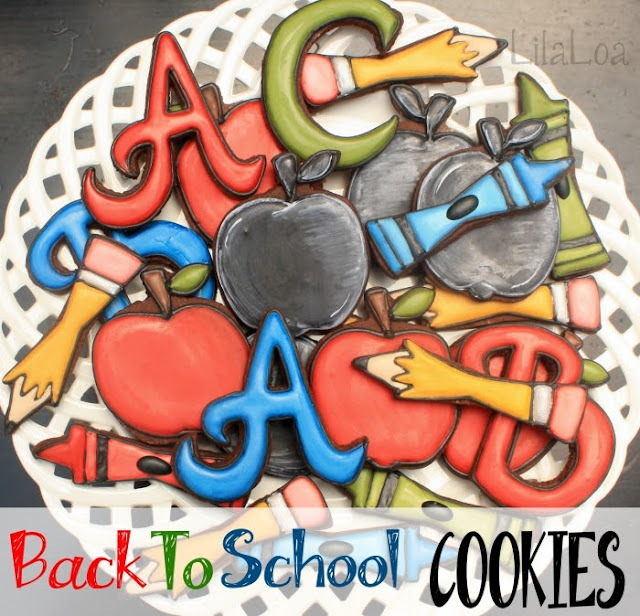 Get the DECORATED PENCIL COOKIES TUTORIAL. See the DECORATED CRAYON COOKIES TUTORIAL. 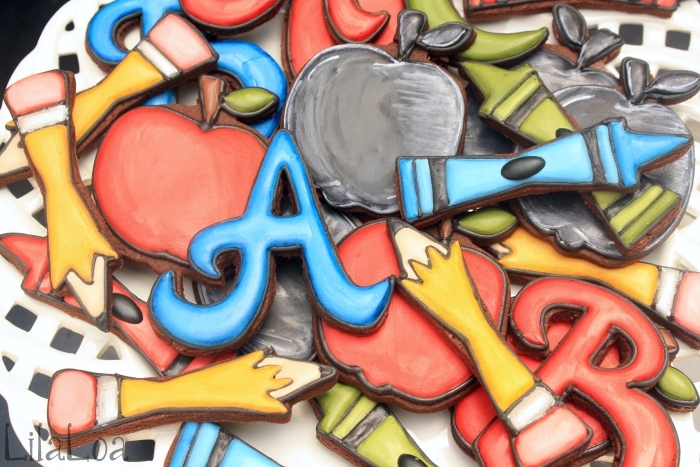 Grab the cutters: ABCs, PENCIL, CRAYON, and APPLE.